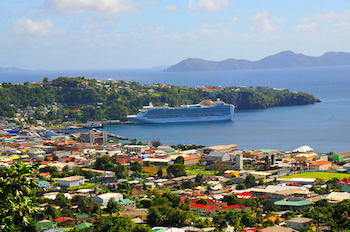 The compact city of Kingstown is the capital of the eastern Caribbean island nation of St. Vincent and the Grenadines. It is also a major port city for the Windward Islands, a chain of Caribbean Islands that includes locales beyond St. Vincent and the Grenadines. Bananas, coconuts and arrowroot are the major exports through Kingstown. The capital city is on St. Vincent, by far the largest of a group of 30 islands which also include Bequia, Balliceau, Canouan, Mayreau, Mustique, Isle D’Quatre, Petit Saint Vincent, and Union Island. Combined they had a 2013 population of 109,373. With a population of approximately 40,020 in 2014, Kingstown is one of the least populous capitals in the world. Although St. Vincent and nearby islands were explored by Christopher Columbus in 1498, resistance by native Carib Indians prevented permanent European settlement until 1719. Three years later in 1722, French settlers founded what would become the city of Kingstown. St. Vincent became a British colony by the Treaty of Paris in 1763 which was the result of the Seven Years War, also known as the French and Indian War on the North American continent. The British called the island’s largest settlement Kingstown and began to develop its port. Ten years after the Treaty, the British formally divided St. Vincent. English and other Europeans lived at the south end of the island and the Caribs were relegated to the north. This partition, however, did not work as conflicts between the groups persisted. Finally in 1776, after the Caribs revolted and were subdued by the British, the survivors were deported to islands off the coast of present-day Honduras. Sugarcane cultivation, which began in 1720 soon after the first French settlers arrived, brought thousands of Africans to St. Vincent. Before long they were the majority of inhabitants of Kingstown. Like the French before them, the British used enslaved Africans to work plantations of sugar, coffee, indigo, tobacco, cotton, and cocoa until the British Parliament abolished slavery in the entire Empire in 1833. After a period of apprenticeship, full emancipation finally came to St. Vincent in 1838. Initially British planters brought in Portuguese workers in the 1840s and East Indian laborers arrived between 1861 and 1888. Nonetheless the plantation economy declined over time with many landowners abandoning their estates and leaving the land to be cultivated by liberated Africans. Other Africans became the craftsmen and laboring classes in Kingstown along with the descendants of Portuguese and East Indian workers. When St. Vincent and the Grenadines gained full independence in 1979, Kingstown became its capital. Commonly referred as the City of Arches, the city has preserved much of its colonial architecture in magnificent churches, cobbled streets, and historic public stone buildings which combine traditional and modern styles. Numerous old structures reflect the French colonial architectural style. Kingstown boasts the oldest botanical gardens in the western hemisphere. The gardens were founded in 1765. Captain William Bligh, who became famous because of the Mutiny on the Bounty, brought breadfruit seeds to the gardens in 1793. In 1991 the city reclaimed land from the sea to construct the Financial Complex which comprises much of the Kingstown central business district. The office of the Prime Minister and other major government offices are on that land as well. “St. Vincent, Kingstown,” http://discoversvg.com/index.php/en/stvincent/around-st-vincent/kingstown; “Introducing Kingstown,” http://www.lonelyplanet.com/st-vincent-and-the-grenadines/st-vincent/kingstown; “St Vincent Sights, Parks,” http://www.lonelyplanet.com/st-vincent-and-the-grenadines/st-vincent/kingstown/sights/parks-gardens/st-vincent-botanic-gardens#ixzz3Q98btDUT.